A slow growing, finely textured tree. The distinctive, blue-green, heart-shaped leaves turn a yellow to apricot fall color. They autumn leaves give off a spicy, brown sugar odor. 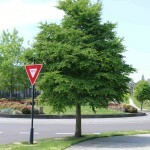 It is a pyramidal tree when young, becoming open and rounded with age. 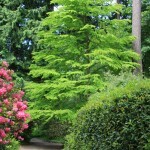 It needs a rich, moist, well-drained soil and full sun, and does better in areas without hot, dry winds.